In a season already notable for the official demonization of British Muslims (see "Long Black Veil"), the new assault twisted the screws even tighter. It is obvious that Blair has been badly stung by his American partner's rejection at the polls, which makes his own fanatical devotion to Bush and the bloodsoaked folly in Iraq look even more absurd. His frenzied waving of the terror flag is, in part, Blair's panicked response to the political diminishment of the Washington regime that has been a mainstay of his own power. That power is now at its lowest ebb. His party is politically bankrupt, with its worst poll numbers in more than 20 years â€“ largely due to the cynicism, distrust and revulsion bred by the Iraq War. Blair himself is now under criminal investigation for allegedly selling peerages in exchange for campaign donations and huge private loans to Labour which party leaders then hid from auditors. He is to be questioned "under caution" â€“ i.e., as a target of the probe â€“ by police in the coming weeks. And yet another corruption investigation is now cranking up, the Times reports, centering on Blair's personal intervention in the sale of a $50 million military air traffic control system to debt-wracked Tanzania â€“ which has a grand total of eight military airplanes. Despite objections from the World Bank that Tanzania could have obtained a civilian system for a tenth of that price, Blair overruled his own cabinet, which had also rejected the deal, and forced it through on behalf of BAE Systems, the UK defense contractor and Carlyle Group partner. Another beneficiary was one of the UK's most powerful banks, Barclays, which loaned Tanzania the money for the deal. The African nation repaid this debt with foreign aid money that Blair's government had given it â€“ ostensibly to support public education â€“ while BAE allegedly slipped big-time baksheesh to Tanzanian officials to clinch the deal. In the end, Blair essentially served as a bagman for a bribe-greased transfer of public money to Barclays and BAE. 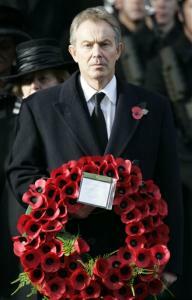 Thus mired in corruption, deeply unpopular, inextricably linked to a war every bit as pointless and destructive as the one commemorated on Armistice Day, what other course is left for the lame-duck Labour government but to turn once again to terror to justify its continued stranglehold on power and the increasingly intrusive police state it is constructing as Blair's legacy? And so, just two days after the U.S. elections, the latest operation designed to terrorize the British public began with an unprecedented speech by MI5 chief Dame Eliza Manningham-Buller. The UK's spymaster rarely speaks in public, and almost never divulges details of intelligence operations; yet there was the redoubtable double-barreled spook at the podium, throwing out scaremongering numbers like Senator Joe McCarthy in days of yore, waving around his ever-changing enumerations of "known Communists in the State Department." In a speech pre-leaked for maximum effect, Manningham-Buller doled out artfully vague, impossible-to-verify "intelligence" of "more than 30 active terrorist plots" in the works among more than "200 terrorist networks" in Britain with at least "1,800 active terrorists" (all Muslims, natch) threatening the nation with "mass casualty suicide attacks" which could use "chemicals, bacteriological agents, radioactive materials and" â€“ wait for it â€“ "even nuclear technology." Manningham-Buller was somewhat less forthcoming on why MI5 was allowing 1,800 known and identified active terrorists swan around the country building nuclear bombs, but in a follow-up to her speech, the nation's top policeman, Sir Ian Blair (no relation to the PM), gave a clue, citing the "inflexibility" of the nation's justice system, which apparently gives accused terrorists too much leeway to gum up the works with all that legal rights jazz. Sir Ian obviously prefers the kind of flexibility that led his officers to kill a Brazilian man strolling through a London subway station last year because he "looked" like some kind of Muslim darky about to blow up a train. Needless to say, both Sir Ian and Dame Spy backed the implementation of even more draconian state powers to deal with this claim of runaway growth in homegrown terrorism. These extensions of the liberty-stripping strictures already laid on the British people â€“ the most surveilled, tracked, monitored and catalogued population in the world, with the possible exception of North Korea â€“ are to be rolled into an omnibus "Terror Bill" in the next session of Parliament, consolidating the vast number of "security measures" that have been adopted piecemeal in the past five years. With this new Terror Law looming, and mandatory biometric ID cards coming soon, and police already empowered to paw at will through such private affairs as medical records â€“ not to mention plans to plant electronic tags on every car in the nation to keep tabs on every journey and tax the drivers accordingly â€“ the boxed-in, Big-Brothered British public ain't seen nothin' yet. But how to justify such permanent emergency measures? How to ensure that the guardians of the state can remain unaccountable in their power and privilege, their every action shielded by the sacred need for "security"? With no foreign state posing even the remotest threat to the nation, a leader in search of enemies must look within. And here Manningham-Buller's broadside â€“ which was publicly, eagerly embraced by Tony Blair â€“ moved from the usual heated rhetoric of an agency head seeking bigger budgets and greater powers to something far more sinister. For Dame Spy, with her boss's assent, repeated the blood libel that was once the province of rabble-rousing tabloids and the neo-fascists of the British National Party but is now, apparently, the basis of official government policy: the charge that at least 100,000 British Muslims, if not more, "supported" the July 7, 2005 bombings that killed 56 people in London. This extraordinary claim paints every member of the Muslim community with suspicion: 100,000 backers of murderous terror â€“ they must be everywhere! Is it you, Shahid, behind the counter at the corner shop? Is it you, Ayesha, at the grocery store till? Is it that Muslim lawyer who was criticizing Blair on TV the other night? Is it that mother who wears a veil when she brings her children to the local school? Is it Dr. Khan who operated on Granny last year? Is it that member of Parliament, that banker, that plumber, those boys in the Man United shirts standing on the corner? With such a huge number of terrorist supporters out there, surely some of the Muslims you know, some of the people you see every day, are secretly hoping that you and your nice, white, non-Muslim family will be blown to bits by Islamic martyrs. Some of them are even planning for it. Be afraid; be very afraid. And keep your eye on them. That is the poison that Blair and his spies are injecting into British society. But where does this 100,000 figure come from? Chiefly from a poll sponsored by the arch-conservative Daily Telegraph just after the July 7 attack. However, the Blairites' melodramatic interpretation of this shaky data is based on a willful misreading of the question that elicited it. The Telegraph poll asked Muslims, "Do you personally have any sympathy with the feelings and motives of those who carried out the attacks?" The question had nothing to do with supporting the actual violence, but dealt only with any understanding the respondents might have of the causes that presumably drove the bombers to act. It is precisely the same as asking Catholics in 1970s Belfast if they had "any sympathy with the feelings" of the IRA bombers who killed Lord Mountbatten, the Queen's cousin, or blew up the Guilford pub. Alternatively, imagine the percentage of white American Southerners who would say today that they had "sympathy with the feelings and motives" that drove their ancestors into violent rebellion and led to a war that killed more than half a million Americans. You can easily have sympathy or insight into the feelings of a rebel or extremist who arises from your own community without condoning their actions. But even in the unscientific Telegraph poll, only 13 percent of Muslims said they felt any resonance at all with the bombers' anger. Yet this is the foundation of the Blair government's repeated charge that Britain is nursing more than 100,000 terrorist vipers in its bosom â€“ a vast internal enemy that can only be kept down by the regrettable but necessary curtailment of civil liberties for at least "a generation." The truth is far from that, however. This year, the 1990 Trust, a UK human rights charity, carried out an extensive survey of British Muslims, and asked directly a question that goes to the heart of the Blairite blood libel: "Is it justifiable to commit acts of terrorism against civilians in the UK?" Less than 2 percent said such acts might be justifiable; almost 97 percent said they were not legitimate in any circumstances. Again, one might compare this to Northern Ireland; even today the number of people there who would support renewed IRA terror against the English â€“ or Loyalist terror against Irish Catholic Britons â€“ would likely be larger than 2 percent. Yet once again it is the Muslims who are accused â€“ by the most powerful voices in the UK government, society and media â€“ of being "a community which is the source of such a great menace" and has made "no obvious effort to address the problem [of extremism] from within." The above quotes come from a column in last Sunday's Observer â€“ an article which represents a chilling reminder of how truly effective the terror card can be in cowing dissent against the state and sowing bitter division in society. The author was Henry Porter, the novelist and commentator who in the past two years has become one of the great champions of civil liberties in Britain, denouncing the government's omnivorous acquisition of unchecked "security" powers. At one point, Porter even engaged in a vigorous print debate with Blair himself in the newspaper, speaking truth directly to power. But the McCarthyite waving of big scary numbers by Blair and Manningham-Buller seems to have unmanned Porter. Despite his own sterling work in debunking the lies, exaggerations and manipulations behind the Blairites' self-serving "security" PR campaigns, Porter accepted the MI5 leader's bald assertions at face value. Her unsourced, unspecific allegations suddenly became "clear evidence" that British Muslims are being infected by "a death cult [that] is as alien to British culture as Mayan sacrifice." Porter ends his article with a stunning call for racial profiling, proclaiming that "one of the values of liberal democracy is discretion â€“ the ability to concentrate the power of the state on a problem and make the distinction between those who are likely to break the law and those who aren't." British Muslims have overwhelmingly â€“ and publicly, continually â€“ rejected terrorism. They have voiced their overwhelming acceptance of "British values": more than 92 percent in the 1990 Trust survey said there is no conflict between being a faithful Muslim and a full citizen in the UK's multicultural, secular society. (Ask U.S. evangelicals the same question, and see how much acceptance of America's multicultural, secular society you'll find.) Yet after a good dose of Doctor Blair's Patented Feel-The-Fear Elixir, even a stalwart of liberty like Henry Porter now sees his Muslim fellow citizens as "a problem" requiring the concentrated, discretionary "power of the state" to "solve" in some way. The well-cooked, carefully packaged elixir of fear has intoxicated America and Britain for five years now. Last Tuesday, the American people began to shake off their stupor, at least for the moment. But in the Mother Country â€“ where national elections are still three, perhaps four years away â€“ the old hootch seems as potent as ever, blurring the vision of dissidents and government officials alike. But on one point, of course, Porter is right on the money. There is a death cult threatening Britain from within, fomenting terrorism and Islamic extremism with its irrational philosophy, and led by sinister figures who, in Blair's own stirring words last week, "want to entice young people into something wicked and violent but utterly futile." But the locus of this dangerous cult â€“ which has facilitated the killing of hundreds of thousands of innocent people â€“ is not to be found in Britain's multifarious Muslim community. No, it was there in plain sight on Armistice Day and Remembrance Sunday, dressed in a suit and tie, surrounded by royalty, singing hymns and laying wreaths. Meanwhile, on that same weekend, four more British soldiers â€“ and almost 300 civilians â€“ were slaughtered in the wicked, violent and utterly futile act of state terror perpetrated by the Bush-Blair death cult in Iraq.